A devotee of alternative music since before her teens, Daralyn (Dal) has developed a love of radio. As the music scene evolved, so did Dal's musical tastes and today she finds herself very multi-dimensional in her appreciation for different genres. Among her credentials are radio stints in upstate New York, Vermont, and at WMPG here in Portland Maine. 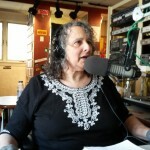 Although her affiliation with WMPG has not been constant owing to life and medical issues, the fire within still burns bright for alternative/community radio. As an out and proud trans woman, Dal currently brings to WMPG two things very close and important to her.......her life-long passion for contemporary Celtic music and timely LGB and especially T-centric news of the day from around the world.